There is nothing quite exciting as discovering more ways to dress up and play up your wardrobe! Spring has officially arrived, and this season is moving fashionably forward. Our look of the week mixes casual cool with a feminine edge. This look is ideal for the social fashionista who is ready to transition into the weekend. We focused on a casual, sleeveless denim button-up by Current/Elliott that goes with practically everything. For this edgy ensemble, we paired the denim top with a bandage a-line mini skirt - a playful way to add a polished vibe. 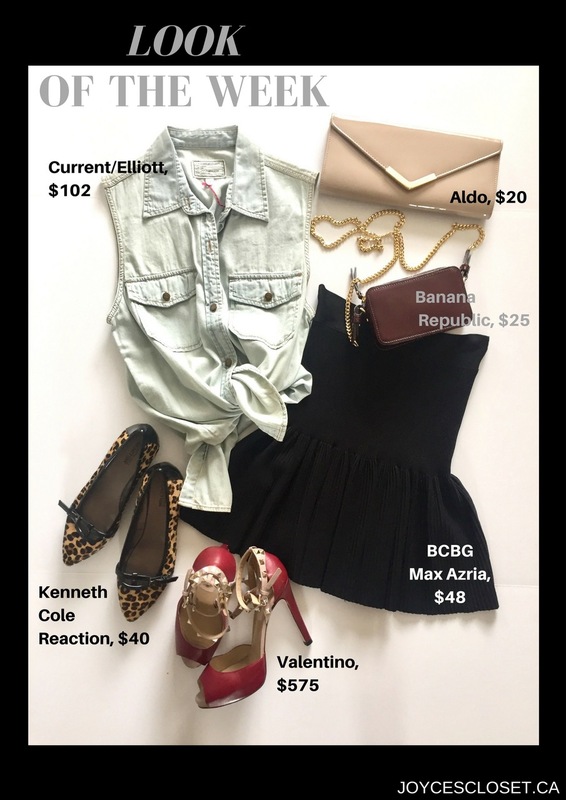 A pair of leopard patterned Kenneth Cole Reaction flats and patent burgundy mini cross body purse from Banana Republic can set a well-dressed tone for the day, and you can easily switch to dressing up at night with an Aldo clutch and gorgeous pair of studded peep toe Valentinos at night. Keep your look cohesive and top it off with a moto jacket and red lips! Spring into style and shop this look at JoycesCloset.ca.